Abstract: There is a large body of evidence that decision makers frequently depart from Bayesian updating. This paper introduces a model, robust maximum likelihood (RML) updating, where deviations from Bayesian updating are due to multiple priors/ambiguity. The primitive of the analysis is the decision maker's preferences over acts before and after the arrival of new information. 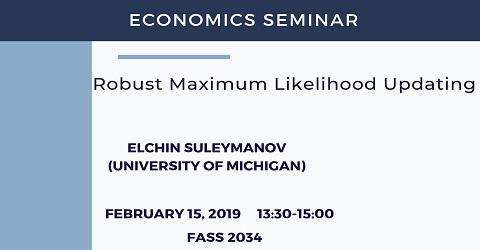 The main axioms characterize a representation where the decision maker's probability assessment can be described by a benchmark prior, which is reflected in her ex ante ranking of acts, and a set of plausible priors, which is revealed from her updated preferences. When new information is received, decision makers revise their benchmark prior within the set of plausible priors via the maximum likelihood principle in a way that ensures maximally dynamically consistent behavior, and update the new prior using Bayes' rule. RML updating accommodates most commonly observed biases in probabilistic reasoning.